respective customized budgetary requirements for 2016. 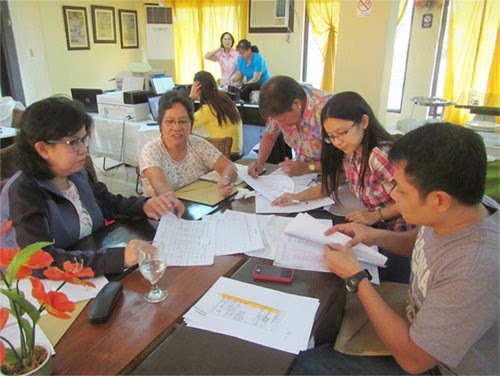 Four island-wide consultative meetings were held simultaneously on November 4-7, 2014 which gathered a total of 191 Regional Agricultural and Fishery Council (RAFC) Executive Officers, RAFC and Provincial Agricultural and Fishery Council (PAFC) Coordinators. Following the Joint Performance Review and Planning Workshop held with RAFC and selected PAFC Coordinators in Naga in October, the Philippine Council for Agriculture and Fisheries (PCAF) spearheaded the island-wide meetings to provide a venue for the RAFC Executive Officers and AFC Coordinators to have a common and shared understanding of the AFC’s roles and functions in relation to the PCAF and cascade the outputs of the said joint performance review and planning workshop. The meetings also enabled the consolidation of all AFC reports and documents necessary to substantiate their respective accomplishments for the first three quarters of 2014 and preparation of their respective customized plan and budget proposals for 2016. Workshops were also conducted for the participants to identify gaps and possible doable solutions to address the gaps in the operations of their respective councils to improve their consultations and monitoring activities. They also proposed criteria for the selection of Municipal Agricultural and Fishery Councils (MAFCs) that will be funded in 2015. “The AFC Coordinators are the action officers of the councils who ensure the preparation of reports and other documents needed from the municipalities, provinces and regions. But, most importantly, they are our partners who provide overall supervision of activities at the ground level. In that sense, they are the PCAF’s unifying link in implementing its mandates and initiatives from the regional down to the municipal, and even the barangay, levels,” Local Support and Coordination Division Chief Elmer Estiandan said. The consultative meetings for executive officers and coordinators from Luzon A (CAR, Regions 1, 2, & 3) was held in La Union while the Luzon B (Regions 4A, 4B and 5) meeting was held in Baras, Rizal. Meanwhile, the meetings for the Visayas (Regions 6, 7, & 8) and Mindanao clusters (Regions 9, 10, 11, 12, Caraga and ARMM were held in Cebu City and General Santos City, respectively. “As we gear up for our upcoming efforts, may we always uphold the AFC’s crucial roles as VOICE and BRIDGES of the farming and fishing communities. As our partners in the local levels, you play a large part in achieving our targets under the MFO on Agriculture and Fishery Policy Services,” PCAF Exec. Dir. Ariel Cayanan said when he spoke to the participants of the consultative meetings for the Visayas and Mindanao clusters. Deputy Exec. Dir. Florabelle Uy-Yap, on the other hand, graced the Luzon A and Luzon B meetings and underscored the importance of the AFCs’ consultation activities are, especially in yielding sound policy recommendations and addressing policy-related concerns. Aside from the consolidated data on the AFCs accomplishments for January to October 2014, as well as the proposed criteria for selection of MAFCs to be funded, recommendations to resolve operational gaps and customized 2016 budget, the workshop also enabled the executive officers and coordinators to lay out their respective schedules of activities for 2015. The AFCs were created through Executive Order No. 116 on January 30, 1987 to serve as an advisory body at the regional, provincial, city and municipal levels primarily in line of the government’s thrust to promote private sector participation in agricultural and fishery development through consultations, advocacy, planning, monitoring and program and project evaluation. The AFC coordinators, who are appointed by the AFC Vice Chairperson from the government sector, perform the secretariat function for the council and facilitate the fund releases, monitor disbursement and liquidation of the AFC Maintenance and Other Operating Expenses. Meanwhile, in March this year, a DA Memorandum Circular mandated the establishment of RAFC Offices in Department of Agriculture’s (DA) Regional Field Offices (RFOs) to promote transparency, institutionalize private sector involvement and ensure effective, reasonable and meaningful participation in agriculture and fisheries participatory development at the RFOs. Tasked to supervise the operations of these RAFC Offices are the RAFC Executive Officers. In addition, they provide secretariat support to the RAFC and coordinate and monitor agri-fishery projects. With the establishment of the PCAF through the consolidation of the National Agricultural and Fishery Council and the Livestock Development Council, the AFCs, together with the National Sectoral Committees, are seen to play a more active role in shaping national and local agri-fishery development agenda and in the enhancement of the responsiveness and relevance of priority policies and programs.